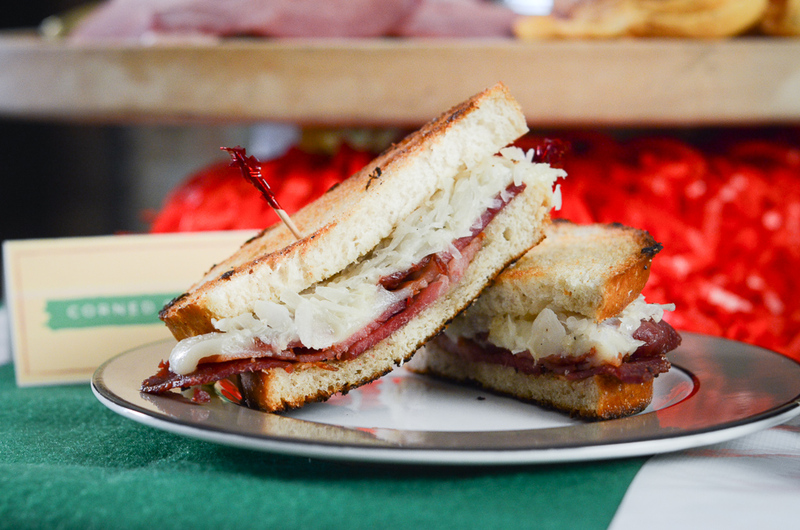 Everybody loves Reuben sandwiches, but do you know what makes a Reuben even better? Homemade corned beef! This recipe takes some time to make but it is absolutely worth it. Place the water into a large 6 to 8 quart stockpot along with salt, sugar, saltpeter, cinnamon stick, mustard seeds, peppercorns, cloves, allspice, juniper berries, bay leaves and ginger. Cook over high heat until the salt and sugar have dissolved. Remove from the heat and add the ice. Stir until the ice has melted. If necessary, place the brine into the refrigerator until it reaches a temperature of 45 degrees F. Once it has cooled, place the brisket in a 2-gallon zip top bag and add the brine. Seal and lay flat inside a container, cover and place in the refrigerator for 10 days. Check daily to make sure the beef is completely submerged and stir the brine. After 7-10 days, remove from the brine and rinse well under cool water. Place the brisket into a pot just large enough to hold the meat, add the onion, carrot and celery and cover with water by 1-inch. Set over high heat and bring to a boil. Reduce the heat to low, cover and gently simmer for 2 1/2 to 3 hours or until the meat is fork tender. Remove from the pot and thinly slice across the grain.